Sorry it has been so long since my last post. We had a lot going on. Before making it to D.C. we stayed with Uncle Larry in New Jersey. This gave us some time to catch up on sleep, do some laundry and look for a short term apartment. For the most part things there were pretty quiet. One day we did go with Jeff's Aunt Mindy to lunch and then to the Grounds for Sculpture. The Grounds for Sculpture was amazing. My favorite sculptures were those of famous paintings. Based on Edouard Manet's "Olympia". Based on Renoir's "The Boating Party". Other days in New Jersey were spent sketching, eating Rita's, and watching football. Finally we had an appointment to look at an apartment in Arlington Virginia on the subway line. It was a winner. When we were in Jerusalem we didn't get around to doing much touristy stuff because we thought we were going to be there 3-6 months. We ended up working and just trying to survive our apartment. We decided when we got to D.C. we would start doing stuff right away. Our first day out we went to the National Gallery. We went there the last time we came to D.C. but we really wanted to go back. On the way back we stopped at the Pentagon Memorial because Uncle Larry insisted we go see it. It was unexpected. Instead of a monument they created a beautiful park. Friday we went to the National Air and Space Museum. They had a lot of cool planes. They had the Spirit of St. Louis. They had the Wright Brother's plane. Jeff was super thrilled they had the studio model of the USS Enterprise. He even found a channel here that basically plays Star Trek non-stop. I may turn into a trekkie before this trip is over. Saturday we had plans to go to the botanical gardens, walk around the nearby Chinatown, and end the night with sushi! But our plans didn't really work out. First the botanical gardens were very small and we saw the thing in maybe an hour. Chinatown was not that close. And the sushi restaurant we wanted to go to had shut down. We ended up walking around the National Mall and seeing the monuments. After our walk that day we had had almost completed 10 miles and were up for something heartier than sushi. We went to Jeff's favorite steakhouse chain BLT. When Jeff's steak wasn't cooked like he asked even though he had already eaten half of it they insisted on making him a new one, taking it off the bill, and giving us two free sides and three desserts! Three desserts! We are convinced they must have mistaken Jeff for a food critic. Works for us! Sunday and Monday football happened. And baseball also happened because the Yankees made it to the playoffs. 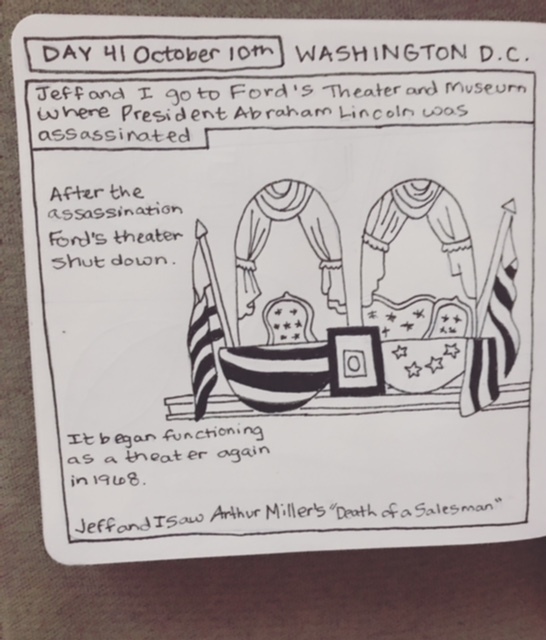 Tuesday we took a break from sports and went to Ford's Theater and Museum where President Lincoln was assassinated. You are even able to go to the old boarding house across the street where Lincoln was brought after he was shot. The theater is a working theater again. After the assassination it shut down. It reopened in 1968. Later that evening we went back to see Arthur Miller's "Death of a Salesman". That play is brilliant. In between we went to the Smithsonian Museum of American Art. I got to see my first painting by Anna Marie Robertson Moses aka Grandma Moses! And this painting by one of my favorite American artists Thomas Hart Benton. After some wonderful days of sightseeing we are now getting caught up on work stuff.